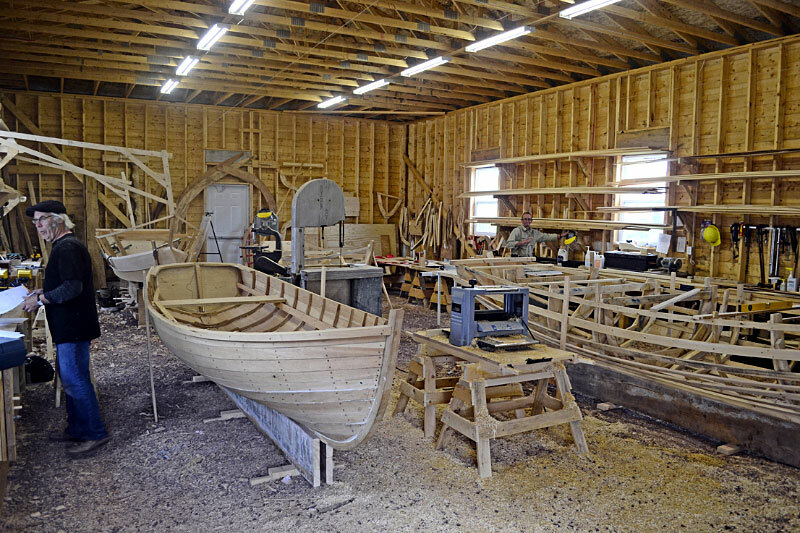 The Wooden Boat Museum of Newfoundland & Labrador offers Boat Building Workshops that teach the basic skills and knowledge required to build a wooden boat. Workshop participants actively learn how to build a traditional wooden boat through hands-on training with instruction and interpretation from our resident boat builder and museum staff. Workshops are offered at various levels with each level increasing in duration, material covered, and skills developed. One day workshops take place every Saturday during July and August and offer visitors the chance to take part in the construction of a rodney. Originally built by Marcus French of Winterton, this rodney was documented by folklorist David Taylor in the 1970s and is now being reconstructed from the information Mr. French provided through oral history interviews, measurements collected in fieldwork and the moulds that have been preserved by the Museum. Participants will play an active role in the construction of the rodney while learning about Marcus French and intangible cultural heritage that surrounds building and using traditional wooden boats. Become a Member and get 10% off of all workshop costs and museum merchandise! Contact us to register today. Gift Certificates are also available for purchase! Purchase a gift certificate for $75.00 by using the button below, then call (709)583-2070 or email inquiries@woodenboatmuseum.com to register for any of our summer workshop dates! Become immersed and experience something unique on your next vacation. Build a traditional wooden Newfoundland punt or dory with hands-on instruction and interpretation from our resident boat builder and master storyteller. 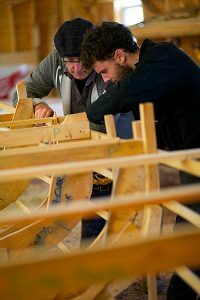 Our five day workshops are designed for those seeking a comprehensive boat building experience. Participants will receive detailed instructions as they progress through each stage of building a 16’4″ rodney originally designed and built by Marcus French of Winterton, Trinity Bay. Learn about traditional boat uses, designs and building techniques in Newfoundland and Labrador while actively constructing the backbone, placing moulds and battens, and shaping timbers and planks. Learn the skills and techniques required to construct a 16′ Grand Banks Dory, originally designed and built in Fortune Bay. Participants will receive detailed instruction as they build a complete dory, progressing through each stage from the backbone, to timbers, planking, and finishing. 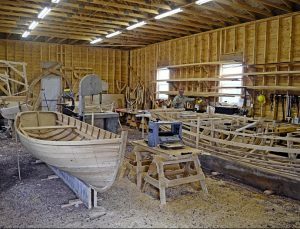 Additional discussions focus on the traditional uses of the Grand Banks fishing dory, how to design a dory of any size, and details of construction. Why just observe, when you can create? In our five day workshop you will learn to build a traditional wooden boat through hands-on training and personalized instruction from our resident boat builder and master story teller. Spend five nights at The Point B&B in Hant’s Harbour and let the ocean sing you to sleep as you breathe our crisp clean air after an enriching day in our sea side boat shed. This package includes full breakfast and boxed lunch. Begin your weekend getaway at The Point B&B in Hant’s Harbour and let the ocean sing you to sleep as you breathe our crisp clean air. Spend Saturday in our boat building workshop in Winterton where our resident boat builder and master story teller will provide hands-on instruction and interpretation of wooden boat building. On Saturday evening enjoy a delicious supper at Grates Cove Studio and enjoy Cajun, Newfoundland and Fusion cuisine after exploring rock wall gardens and out-door sculptures throughout Grates Cove. Available every weekend in July and August – includes Friday and Saturday night accommodations. Double Occupancy (One Workshop) includes accommodations at The Point B&B and meal at Grates Cove Studio for TWO PERSONS, but registration for ONE PERSON in our Saturday Workshop. To register TWO PERSONS for the workshop, please select Double Occupancy (Two Workshops). Alternatively, you can download our Workshop Registration Form 2018 – Weeklong or Day-Long/Children’s Workshop Registration Form and submit. Designed by: New Found Web Solutions.